It's hard for me to believe that St. Patrick's Day is next week! It seems like we just had Valentine's Day. While I have picked up a few things for the leprechaun visit (pencils, tops, mini Rubik cube, chocolate green and gold coins), I haven't come up with how the leprechaun is going to leave it this year. 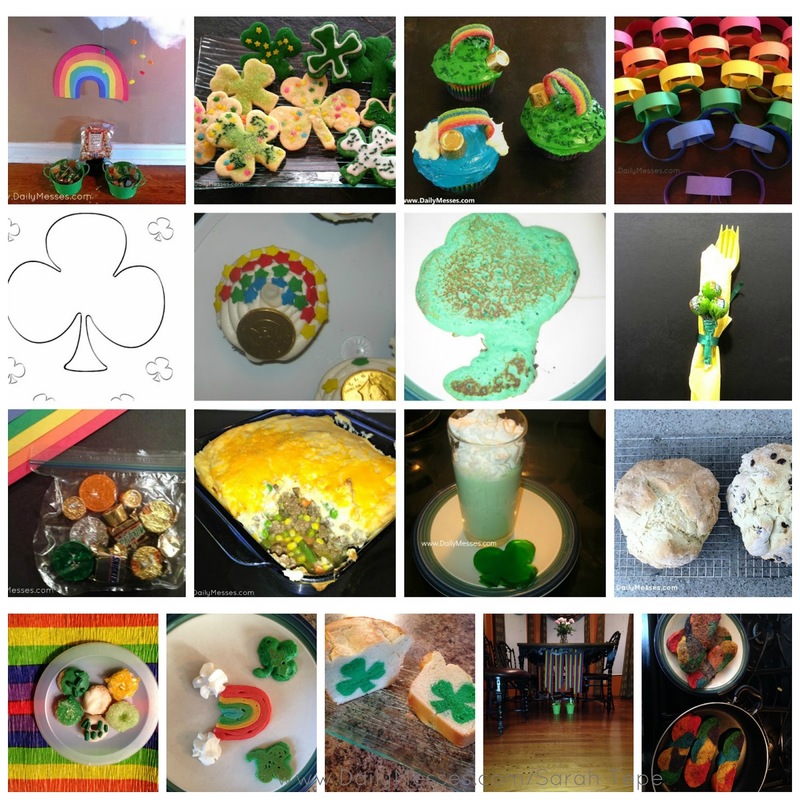 If you are looking for any food, craft, activity, or leprechaun visit ideas, I have some below! Make Rainbow Bread. Last year I made a braided loaf of bread with rainbow colors. After mixing the dough, I separated and dyed the sections different colors. I then rolled out each color into a long strand and braided it together. We used it to make rainbow sandwiches and french toast for St. Patrick's Day. Spray Oreos with Wilton Gold Color Mist Spray (Edible). Spray, let dry. Turn over, spray other side, let dry. I have banned any super messy leprechaun visits, so our leprechaun usually leaves a pot of treats (usually gold colored) for the boys to find. In the past there has been a fun jelly bean raining cloud or a trail of confetti to find their pots of gold. One time there were even leprechaun donuts (see above under food) left with the pots. 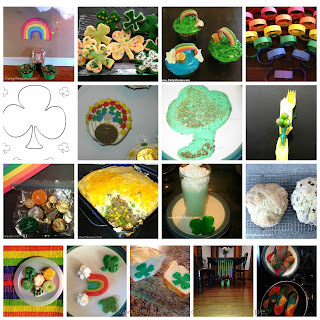 Below are some of our past leprechaun visits and pot of gold filler ideas. Leprechaun Pots of Gold (batting cloud with jelly bean rain over pots of "gold"). Last year, the boys found rainbow crepe paper streamers wrapped around the railings and a trail of coin confetti leading to their hidden pots of treasures. There were a few trails that were dead ends too, so it took them a little while to find their pots of goodies.